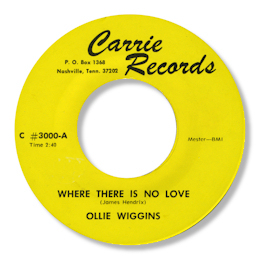 The sole 45 that the obscure Ollie Wiggins recorded has a fine ballad topside. Where There Is No Love shows Wiggins had some grit in his soul and his voice, and the small rhythm section supporting him do a bang up job too. Sometimes simple is the most effective. Rev James Hendricks’ Carrie is best known as a Detroit label but it also had addresses in Nashville and the Carolinas on the 45s he released. This track has a Nashville address and may well have been cut there.